Macro photographers and cryptic critter enthusiasts often consider Wakatobi’s pygmy seahorses to be the Holy Grail of tiny finds. But our waters are also home to other members of the Syngnathidae family that are equally intriguing. We’re talking about the snake-like pipefish, which are ubiquitous inhabitants of the reefs and coastal shallows of Wakatobi. Some species of pipefish that venture on reefs and rubble will sport intricate patterns that allow them to blend with their backgrounds, and some varieties match their coloration to blend with a particular species of coral. 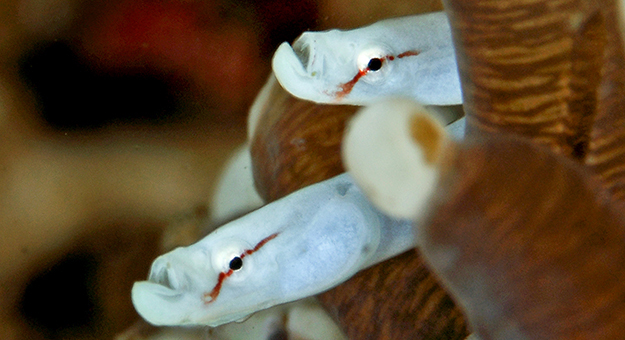 Pipefish are fairly common in certain areas around Wakatobi, but it can take a keen eye to spot these unique animals. Mother nature has endowed pipefish with a masterful array of camouflaging that make them difficult to see, even when you are looking straight at one. But as you begin to hone your spotting skills, it soon becomes apparent that Wakatobi’s waters are especially good hunting grounds for pipes. Many species of pipefish seem almost impossibly thin, but their elusive nature is due not only to this diminutive diameter, but also their coloration and their behavior. Species that hunt in the shallows will often align themselves in a vertical position and sway back and forth with subtle undulations to expertly blend with the seagrasses. Others that venture on reefs and rubble will sport intricate patterns that allow them to blend with their backgrounds, and some varieties match their coloration to blend with a particular species of coral. Though faster than a seahorse, pipefish are still slower than most of the things that would like to eat them, so they too depend on camouflage and concealment to avoid predation. While seahorses tend to be stationary feeders, pipefish are mobile hunters. Many species have blade-like tails to provide locomotion, and they also use the undulations of their body to create forward motion. Though faster than a seahorse, pipefish are still slower than most of the things that would like to eat them, so they too depend on camouflage and concealment to avoid predation. Like their seahorse cousins, pipefish have a distinctively elongated snout created by fused jaws. This is a feeding adaptation because both seahorses and pipefish feed primarily on copeopods. These tiny crustaceans are amazing escape artists, able to speed away at more than 500 body lengths per second. Put in human terms, that would be the equivalent of a swimmer moving at 2,000 miles an hour. But while seahorses use a millisecond-fast snap of their snout to capture a copeopod, pipefish employ a fast rotation of the head to left or right, combined with a relatively powerful suction generated by their long-thin snouts. Pipefish are highly efficient hunters, which is a good thing because their rudimentary digestive system is fairly inefficient at processing their food, so they must feed almost constantly. If you run across a seahorse or pipefish at Wakatobi, chances are good that it’s hunting that next meal. 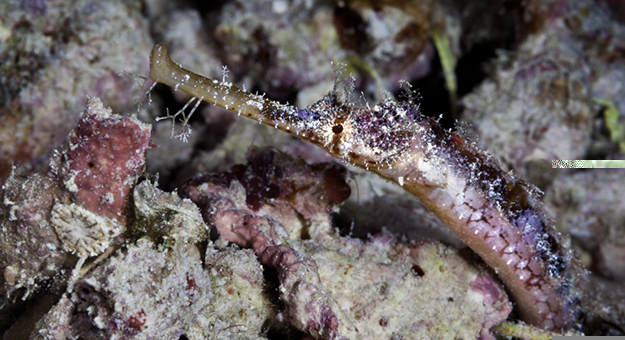 One of the easiest species for first-timers to find may be the network pipefish (Corythoichthys flavofasciatus), which often congregate around the rocks of the Wakatobi pier. Growing to lengths of six inches or more, these pipes are easily recognized by the black and yellow/green banded pattern of the body. 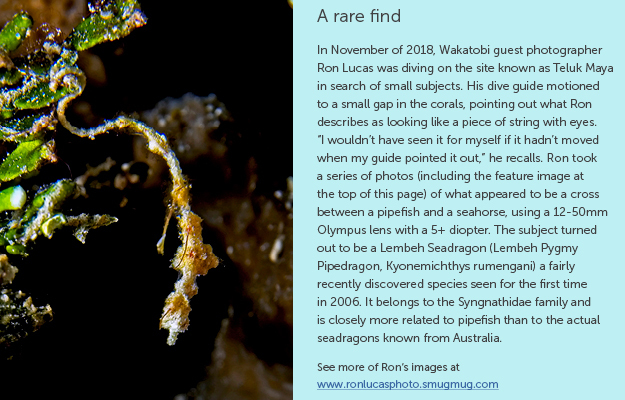 Like most pipefish, they hunt across a limited range, so if you lose sight of one, stay in the area and you’ll likely run across it again soon. To rack up a second species, look for a stand of mushroom coral, and look close among the tentacles. The mushroom coral pipefish can be difficult to spot at first, as it sports the same grayish color as its host coral. Keep looking, because this animal isn’t going anywhere. It rarely leaves the sanctuary of the enveloping tentacles and feeds on the small organisms that become trapped in the coral’s mucus. When you find one, you’ll usually find more. Another promising area to search for pipefish is among the seagrass beds such as those just off the resort beach. Here, you’ll be looking for one of several species that are doing their best to resemble a blade of grass. Your search may also lead you to an animal that doesn’t seem to fit the rules. The pipehorse has the elongated body of a pipefish, combined with the prehensile tail of a seahorse. They can use that tail to grip a strand of grass and wait for food to pass by, but they can also let go and swim about. You’ll need a keen eye to find one of these hybrids, as most are only an inch or two in length. The most difficult aspect of capturing a pipefish with a camera is finding them. Once located, it is extremely unlikely that they will flee, as these are animals that have evolved to hide rather than run. To exploit this behavior, approach slowly without making any sudden or threatening movements. The animal may orient to cover, and possibly go head down, but they will otherwise stay in place, and give you plenty of time to adjust your camera settings and compose the shot. 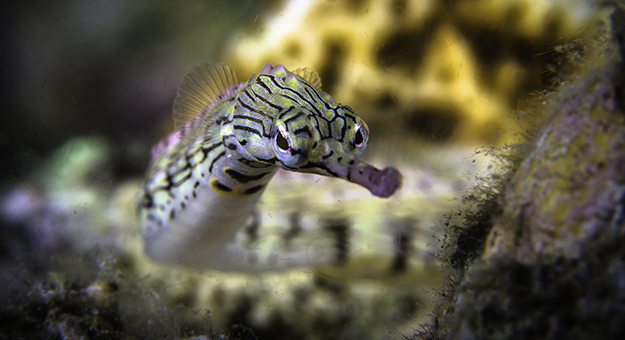 Any camera setup that can fill the frame with a two-inch subject will work for pipefish while photographing pygmies will require a longer lens and a well-developed sense of that lens’s potential of field. It’s common protocol among responsible underwater photographers to limit the number of flash exposures to which pygmies are subjected, as the lights are thought to stress out these tiny creatures. One trick you can use to create a memorable image without harassing the subject is to take some trial shots on an inanimate piece of a structure of approximately the same size and composition as the animal. Once everything is set and ready, you can then turn your attention to your diminutive model. Another technique that a number of photographers use is to have one of Wakatobi’s dive guides hand on them to create a steadying “human tripod” that allows the shooter to move in close while maintaining precise control. Regardless of whether you are hoping to capture that perfect image of one of nature’s more bizarre creations, or simply want to locate and observe one of these masters of disguise, the reefs of Wakatobi provide one of the ocean’s most fertile hunting grounds. Next time you visit our reefs, make sure to devote some bottom time to finding these amazing animals. Ready to make your own rare find at Wakatobi? Contact us at office@wakatobi.com or complete a quick trip inquiry at wakatobi.com.